HomeField Advantage. Hanover, Pa. | Embroidery, screen printing and custom promotional products. HomeField Advantage is your source for custom embroidered and screen printed apparel, as well as thousands of promotional products to meet your every need. If you're looking to outfit your staff, build company morale or promote team unity, we've got the options to meet your business goals. 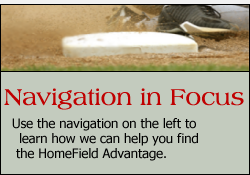 What is the HomeField Advantage? Our staff will work with you to meet your individual and business needs, as well as answer your questions and concerns. Whether you need help creating a new incentive or promotional program or you just need to find the perfect product for an existing program, we have the experience and resources to make it happen. Experience & Quality - Keys to Our Service. Our experienced marketing and sales team is ready and available to help you find exactly the items and products you are seeking, and even offer targeted suggestions for what might work best. If you have any questions or want more information, please contact us today.